The Taste has announced the lineup for this year&apos;s fest, with participants including Hinoki & The Bird, Love & Salt, The Bellwether and Guisados. 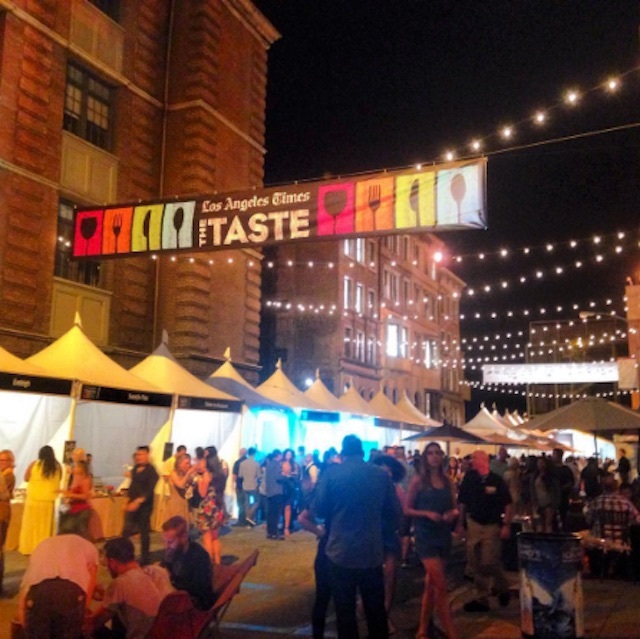 Los Angeles Times&apos; The Taste will take place once again over Labor Day Weekend, September 2-4, at the Paramount Pictures Studios backlot, where you can fill yourself up on samples from L.A.&apos;s best restaurants while meandering the studio&apos;s charming street sets. (I like the fake Ralphs.) There will be five distinct events you can attend over the course of the weekend. On Opening Night, Friday, Sept. 2 from 7:30 p.m. to 10:30 p.m., you can leisurely wander among the many food stations and sample small bites, cocktails, wine and beer. Participants include Badmaash, Moby&apos;s vegan eatery Little Pine, Manhattan Beach Post, Son of a Gun, Sweetfin Poke and Love & Salt. On Saturday, Sept. 3 from 11 a.m. t o 2 p.m., the fest will host Field to Fork. The food will be local and seasonal, and will include conversations about artisanal grain (a real thing), sustainable seafood and vegetarian cooking. Participating restaurants include Aqui es Texcoco, Doomie&apos;s, Jeni&apos;s Splendid Ice Creams, Kye&apos;s Montana, L.A. Chapter and Salazar. That night, from 7:30 p.m. to 10:30 p.m., the L.A. Times&apos; Jonathan Gold and Jenn Harris will host Dinner with a Twist with Broken Spansih/B.S. Taqueria&apos;s Ray Garcia and Michael Lay. Both chefs will talk about their cuisine, and will be joined by Kris Morningstar and Ryan Wainwright of Terrine. There will also be a demo from bartenders Katie Emmerson (The Walker Inn), Nathan Oliver (WOLF) and Tobin Shea (Redbird). Participating restaurants include Church & State, HACHE LA (this writer&apos;s favorite burger joint in L.A.), LEONA, Public School, The Bellwether and The Raymond 1886. Daytime on Sunday, from 11 a.m. to 2 p.m., there will be a block party with demos from Duff Goldman (Charm City Cakes West), Ramiro Arvizu and Jaime Martin del Campo (La Casita/Mexicano), and a unique discussion led by the Times&apos; Noelle Carter on how to get the most out of ingredients with Bruce Kalman (Union/Knead & Co. Pasta Bar), Chris Cormier (L.A. Mission), and Michael Flood (L.A. Regional Food Bank). Participating restaurants include Chichén Itzá, Donut Farm, Hinoki & the Bird, Mainland Poke, Simbal and The Guild. That night, from 7:30 p.m. to 10:30 p.m., J. Gold and Night + Market&apos;s Kris Yenbaroong will host Flavors of L.A. Gold will host a discussion on Filipino cooking with Charles Olalia (Rice Bar), Gary Menes (le computer) and Alvin Cailan (Eggslut/AMBOY). There will also be a demo on Thai cooking from Yenbamroong, a recipe from Nyesha Arrington of LEONA, a cocktail demonstration from Tricia Carr, and an appearance from Baroo&apos;s Kwang Uh. Restaurants include Guisados, Herringbone, Knead & Co. Pasta Bar, Oh Man! Ramen, The Little Jewel of New Orleans and WOLF. Tickets range from $100 to $150 and are available here.